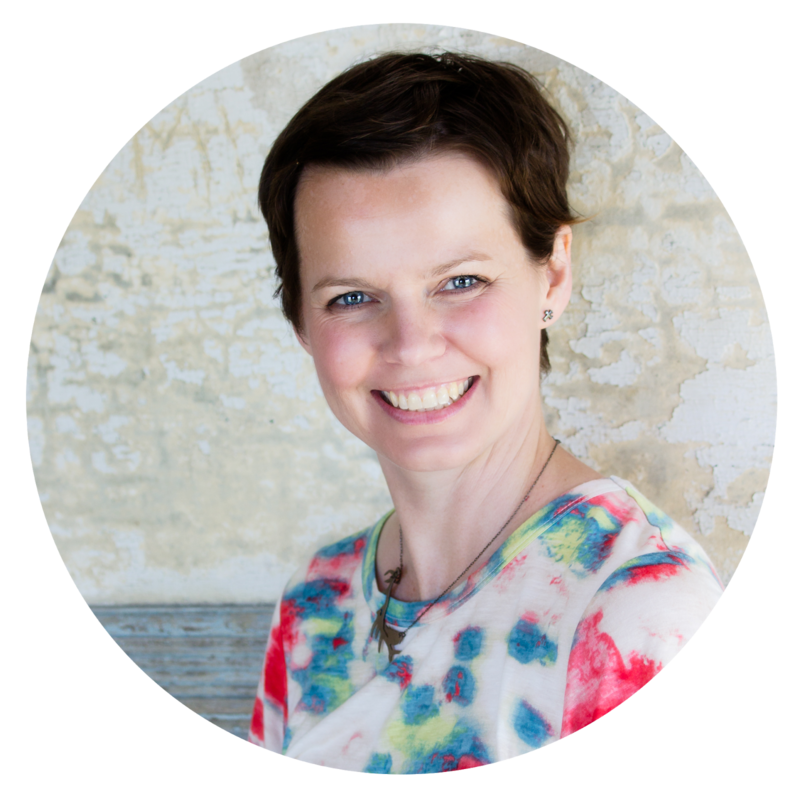 I'm so thrilled to be a part of the Bella Grace blog hop…. Bella Grace is a new publication from Stampington. This image-rich book is a peek into the lives of artists. It goes beyond the behind-the-scenes. To me, it's more about the spirit of creating. What drives us to create. The why's. Then takes you there….nestled into a backpack for a view upon a mountaintop. It makes you want to travel to these places. To spend time with the artist over coffee. And I think that's just what you'll do with Bella Grace. She certainly lives up to her name. One Sunday I wrote and painted this. I hope it inspires you to lay out among the stars. ponder the smallness yet vastness that is You….. 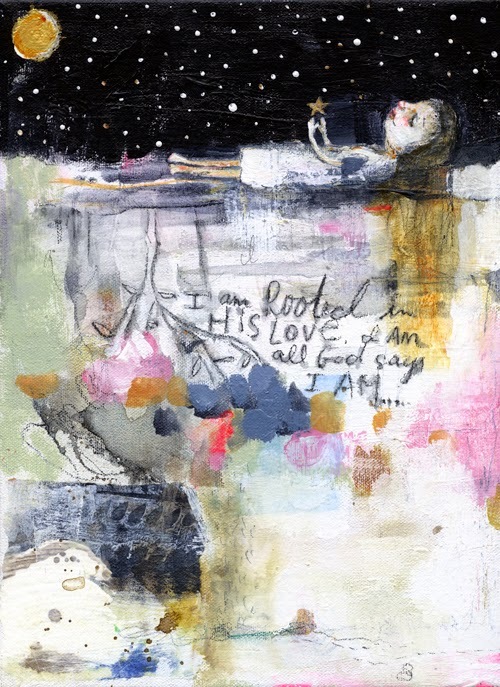 I am Rooted in His love. through spirit I embrace Grace. To cherish what is so freely given. that I am all God says I am. I am one with the Maker of all these things. I am giving away a copy of Bella Grace. Please leave a comment here and will be doing the drawing on September 6th. I've been following as much as I could about this new magazine that simply look fantastic but it is hard to find in my neck of the woods so I would love to win this first issue. Oh my gosh!! I can't wait to see this magazine!! Stampington has wonderful magazines. Love your painting, everyone could use a little soul searching under the stars. Thank-you for this chance! Mindy, thank you for these powerful words of truth. It's a wonder how much we are truly loved by God. His love runs so deep within us! I first realized this deep-rooted love at a very young age. It's about having a personal relationship, discovering your own uniqueness, and sharing the great love you've received to someone else who is looking for it, too. Thank you for the chance to win this beautiful publication! Love your art! Can't wait to see the new magazine! Mindy your work is really evolving...such an inspiration. I have been thinking how we are each meant to be a light unto the world. That is what God wishes for us to be. Keep shining!!! You are such an inspiration Mindy .. The words are so touching .. Thank so much for sharing . This is pulls at my heart...gorgeous painting to go with such powerful words! LOVE IT! You are so inspiring! Your blog is beautiful. Thank you for taking the time to share with so many!n This painting is so tender. Thanks for the opportunity to win! I have enjoyed Stampington magazines for years and this looks like another great one. Your painting and words are very inspiring! That sounds like a great publication. Thanks for the chance to win it. Love your artwork - very inspiring! And, I love that song. We sing it at church. Very powerful and inspiring words and artwork! Thanks for sharing! 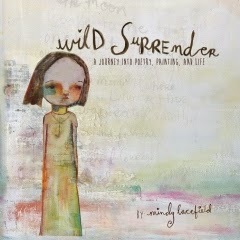 Thank you Mindy for sharing your beautiful artwork and words! I love your poem and artwork. 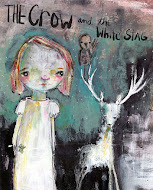 After reading all the other blog posts about Bella Grace, it sounds like it's a beautiful publication. Thanks for sharing! 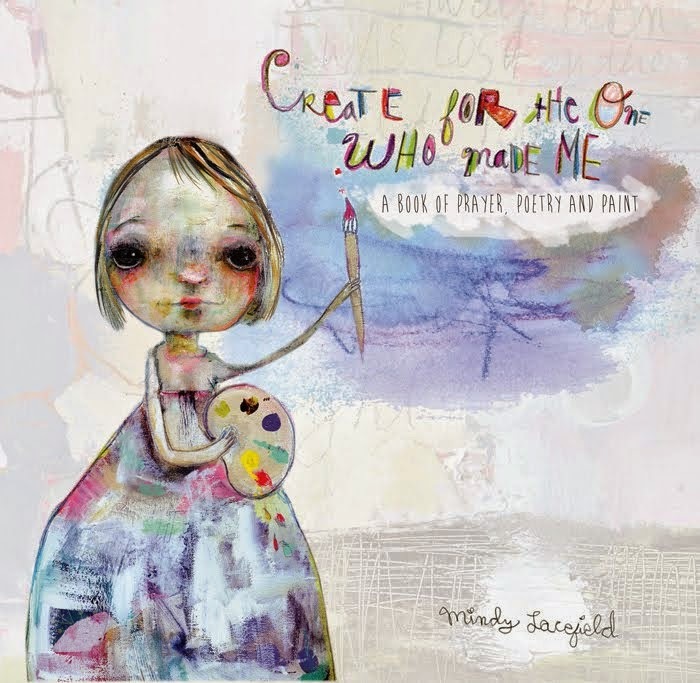 Love your poem and your painting - it reminds me of Chagall. It's nice that things of a spiritual nature can be shared in such a beautiful way. So much of the world is strident and harsh these days. God bless! With your heart felt words and beautiful artwork and Stampingtons attention to detail and quality- what more could we dream of. It will be a keeper for a lifetime! Thank you for sharing your art; both words and pictures are lovely. I love the quote used in this whimsical image, so true and a great affirmation! Beautiful poem and artwork! I really enjoyed it, thanks for holding this give away. Lovely! Thanks for the opportunity to win a copy. I'm very excited to meet Bella Grace! Oh I hear this is selling out in stores so it must be something special. 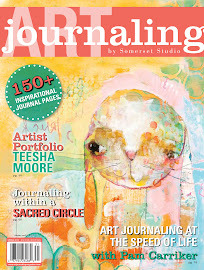 I just love your art and now your in this alluring magazine. Your poem is something I needed to read.... Congratulations to you! Bella Grace .. the names of two of my Grande-Fairies. ADORE!